Kathmandu Video Slot Guide & Review - Casino Answers! Kathmandu is a 5-reel, 9-line Microgaming video slot with scatter wins, wild substitutes, a gamble feature and a free spins feature with a multiplier. 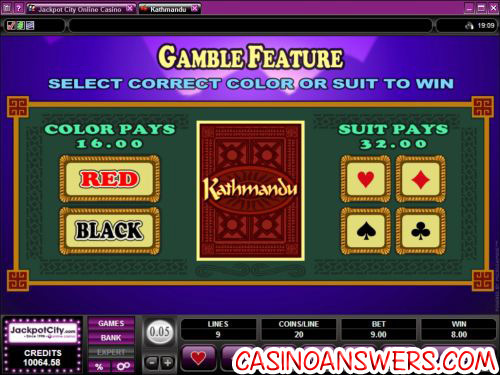 You can play the Kathamandu video slot at 777 Dragon Casino and Gaming Club Casino. Hitting 5 Prayer Wheel symbols on a spin in Kathmandu will win you the 6000X top jackpot. The Prayer Wheel symbol is also one of the wild symbols in the Kathmandu video slot. The Prayer Wheel and Temple symbols will substitute for all symbols except the Scattered Bell symbol. The Scattered Bell is the Kathmandu scatter symbol. Wins using the scatter symbol will be added to payline wins. Scatter wins will be multiplied by the total bet. 3 or more Scattered Bell symbols anywhere on the reels will activate the free spins feature, where you will win 15 free spins and up to a 5X multiplier. During free spins, the Prayer Wheel and Temple symbols will substitute for all symbols except for the Scattered Bell. All bets and paylines played in the free spins feature are the same as the game that activated the free spins feature. If you change Kathmandu over to Expert mode, you will be given the option of using its autoplay feature. You can click the 5X or 10X button for quick access to autoplay spins or you can open the autoplay advanced options by hitting the “Autoplay” button. You will be given the option of playing from 5 to 500 autoplay spins or to stop if a win exceeds or equals various amounts from $100 to $9999. You may cancel autoplay at any time. Kathmandu was released in early 2006, so it is now over four years old. The age of the game shows a bit, but it’s still a good 9-line video slot in part thanks to the free spins and gamble features. We also like that there are two wild symbols in the game. To try Kathmandu out for free, you can get 77 free spins on Kathmandu at 777 Dragon Casino! Where can players from the US play the Kathmandu video slot? Unfortunately, US players are not able to play at Microgaming casinos like 777 Dragon Casino. We recommend US players check out the iSlots at Paradise 8 Casino instead. Do I need to download any software to play Kathmandu? 777 Dragon Casino offers a no-download Flash casino in addition to the downloadable version. If you have any problems playing the Kathmandu Flash game in your browser, make sure you have the latest version of Adobe Flash Player installed on your computer. What special features does the Kathmandu slot machine have? Kathmandu has a free spins feature when three or more scatter symbols appear anywhere on the reels at the same time. There is also a gamble bonus game where you can double or quadruple your winnings by predicting either the colour or the suit of a facedown card. Where can I play the Kathmandu online slot machine? You can play Kathmandu at either 777 Dragon Casino or Gaming Club Casino. 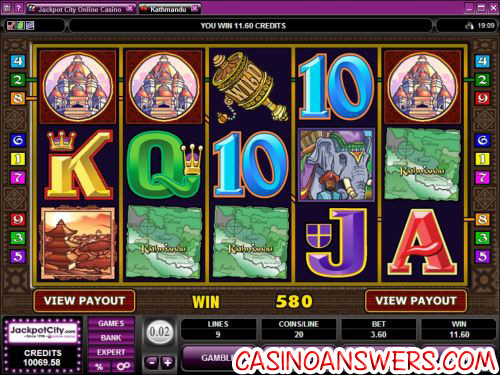 For more information on Gaming Club Casino, please read our Gaming Club Casino Review.